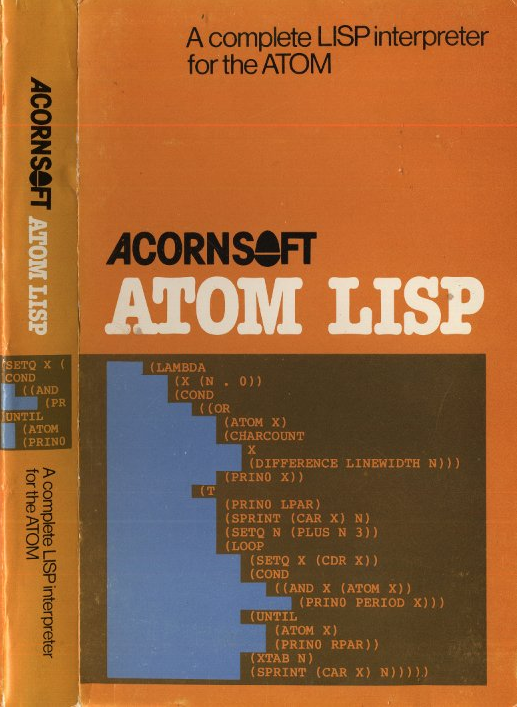 The ATOM LISP interpreter consists of 5½ K of machine-code interpreter plus 3K of initialised LISP workspace containing LISP utilities and constants, which can be deleted to make extra space if not required. It is supplied on cassette and is designed to run on a 8+12K ATOM. Hobbyists who want to discover about the fundamental language of artificial-intelligence research. University and school students who are learning LISP or carrying out research. System designers who require more flexibility in data and control structures than is provided by traditional programming languages. Fully interactive with explicit EVALUATE and VALUE IS messages. Automatic parenthesis count to help in typing complex expressions on the computer. Built-in superprinter to format the printing of large expressions. Editing by screen editing or built-in LISP editor. All errors trapped and optional full traceback printed. PEEK, POKE, and CALL to control hardware and machine-code programs. Functions can have optional arguments with default values. Improved iterative control structures using LOOP, WHILE, and UNTIL functions. Automatic access to COS or DOS commands with "*". Cassette (or disk) input/output control functions. The fast compacting garbage collector automatically finds space for numbers, lists, or character strings if there is any space at all remaining so that the programmer never need be concerned about the details of storage allocation. AND, APPLY, ATOM, BLANK, CALL, CAR, CDR, CAAR, CADR, CDAR, CDDR, CHARP, CHARS, CLOSE, COND, CONS, CR, DEFUN, DIFFERENCE, DOLLAR, EDIT, EQ, ERROR, ERRORSET, EVAL, F, FSUBRP, GET, GETCHAR, GREATERP, LAMBDA, LESSP, LIST, LISTP, LOAD, LOOP, LPAR, MESSOFF, MESSON, MINUS, NIL, NOT, NULL, NUMBERP, OBLIST, OPEN, OR, ORDINAL, PEEK, PERIOD, PLIST, PLUS, POKE, PRINO, PRINT, PROGN, PUT, QUOTE, QUOTIENT, READ, READLINE, RECLAIM, REMAINDER, REMPROP, RPAR, RPLACA, RPLACD, SAVE, SET, SETQ, SUBRP, SPRINT, T, TIMES, UNDEFINED, UNTIL, WHILE, WRITE, WRITEO, ZEROP.